THE GREAT OUTDOORS ONCE AGAIN RECEIVES PERFECT 10-10-10 RATING! Once again, The Great Outdoors was honored to receive the prestigious 10-10-10 rating from Trailer Life Directory. 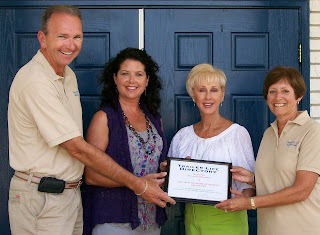 Stan and Julie Grabiec, our Trailer Life representatives, presented the coveted award to our staff on April 15, 2011. "Achievement of this honor is a significant accomplishment and deserves recognition. It takes a special commitment by the management of a park to consistently maintain high standards in all areas of their operation", said Cindy Halley, Vice President-Publisher of the Trailer Life Directory. The Great Outdoors will continue with our commitment to excellence in this field. Our goal is to share this wonderful resort with the RV community......and if you haven't had the opportunity to visit us, come see what a 10-10-10 resort is all about. Remember, you can stay a night or a lifetime - it's up to you!